When installing a Raleigh-Durham storm door, there are several factors to keep in mind. The product itself should be durable, energy efficient and stylish. But most importantly, it should be installed properly to ensure full optimization of its security features. 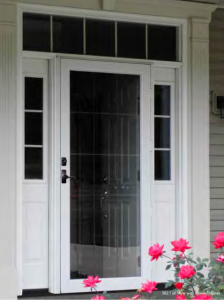 As Raleigh-Durham’s premier home improvement business, we understand the importance of having quality storm door and storm screen door products. Gerald Jones’ factory-trained staff can have the sturdiest of storm doors installed into your home within just a short amount of time. For the modern home, there are sleek, minimalist designs. For the more traditional properties, Gerald Jones suggest doors that are more classical in nature.A Raleigh-Durham storm door, like any other home improvement product, should compliment the style of a home. That’s why we work hard to educate our customers on the expansive inventory of products offered, and in a variety of colors and styles, that work across a broad spectrum of applications. While Raleigh-Durham storm doors are a necessary investment that can yield lifelong benefits, such as draft protection and energy savings. We believe that the provision of such benefits shouldn’t come at a prohibitive cost. Therefore, we at Gerald Jones offer affordable options for the homeowner on a budget, which can be viewed at our showroom in Durham, North Carolina. To learn more about our storm door selection, view our products here. For over three generations, Gerald Jones has served the Raleigh-Durham storm door needs of individuals in Apex, Cary, Chapel Hill, Creedmoor, Durham, Hillsborough, Mebane, Roxboro, Raleigh and surrounding areas. For a quote on a storm door installation, come by our showroom in Durham or contact us at 919-286-1700.